Five Rivers MetroParks earn top recognition at Ohio Parks and Recreation Association (OPRA) Awards of Excellence contest. Five Rivers MetroParks will receive the 2018 Ohio Parks and Recreation Association (OPRA) Award of Excellence in the “Environmental and Interpretive” category for the waste-free initiative at the Wagner Subaru Outdoor Experience. Submitted by MetroParks for his excellence in outdoor recreation leadership and trail stewardship, Andy Niekamp of Dayton Hikers will receive the statewide OPRA Outstanding Citizen Award. Nominations for the OPRA Awards of Excellence are submitted from parks and recreation agencies across Ohio. MetroParks will receive both awards during the annual OPRA Awards Celebration Dinner on Feb. 5 at the Kalahari Convention Center in Sandusky, Ohio. A conservation agency, Five Rivers MetroParks’ mission is to protect the region’s natural heritage and provide outdoor experiences that inspire a personal connection with nature. 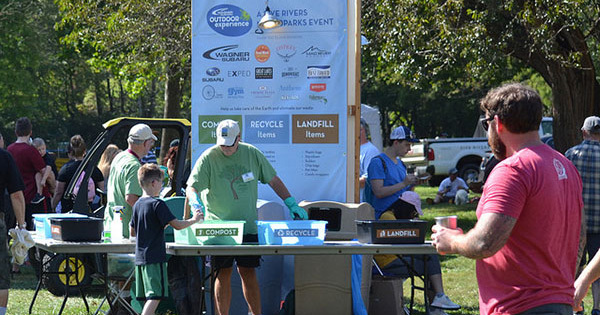 “Waste management — especially working toward waste-free operations — is really important to Five Rivers MetroParks, and ultimately the community we serve as a conservation leader in our region,” said MetroParks sustainability coordinator, Tim Pritchard. MetroParks staff and volunteers who ensure recyclable and compostable waste is collected, separated and sent to Montgomery County’s recycling facility or Cox Arboretum MetroPark to be chipped and turned into compost for MetroParks. Results from the 2017 OutdoorX waste free initiative resulted in more than 1,500 pounds of waste diverted from the landfill, 711 pounds of compost collected and 573 pounds of materials recycled. Niekamp, Kettering resident and 2018 OPRA Outstanding Citizen Award recipient, also is proud of the recognition the region’s MetroParks and trails are receiving. Long-time outdoor recreationalist, Niekamp founded the Dayton Hikers club nearly 10 years ago when he was searching for fellow outdoor enthusiasts to join him on the trails. Using the site MeetUp.com, Niekamp began planning hikes that were open for the public. Currently, Dayton Hikers has more than 5,000 members and is one of the largest outdoor recreation clubs in the region, welcoming hikers from hours away to enjoy the outdoor amenities in Dayton. Niekamp and the Dayton Hikers also were integral to the success of the region’s Google Trekker project. Five Rivers MetroParks and Dayton Hikers captured images of 600 of miles of local hiking, equestrian, mountain biking, water and paved trails using a 50-pound backpack with hundreds of cameras attached. These cameras captured images that would create an immersive Google Maps experience, in which users can virtually experience the region’s trails, plan adventures and more. Going by the trail name “Capitan Blue,” Niekamp hikes thousands of miles each year and is currently on a thru hike of the Florida Trail. In 2017, Niekamp worked with the Buckeye Trail Association on funding for a bridge and boardwalk at Eastwood MetroPark on the Buckeye Trail. His relationship with the Buckeye Trail Association grew after 2011, when he hiked the 1,444-mile Buckeye Trail. After that experience, he became section supervisor of 50 miles of the trail, which includes the longest off-road section of the entire Buckeye Trail. An avid advocate for the region’s trails, Niekamp and members of the Dayton Hikers hosted the Ohio Legislative Trails Caucus for a fireside chat, during which trail users talked about the importance of these outdoor amenities with local representatives. Niekamp also helped bring the region’s trails into the spotlight on an international level while organizing volunteers for the International Trail Symposium in 2017. Learn more about MetroParks’ conservation mission at metroparks.org/conservation. To learn more about Dayton Hikers or join their group, visit their MeetUp page, meetup.com/DaytonHikers.